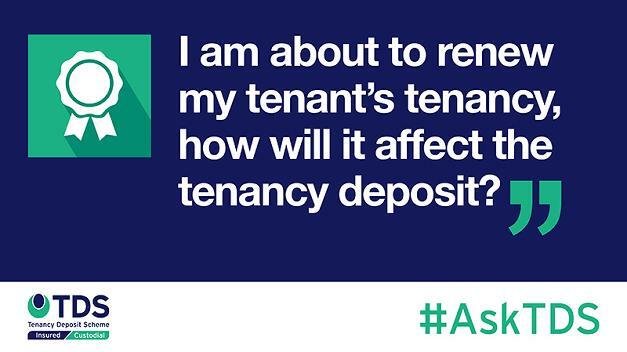 #AskTDS: "I am about to renew my tenant's tenancy, how will it affect the tenancy deposit?" For many landlords, the idea of having long-term, reliable tenants who are keen to renew their tenancy is one they’d be happy with as it takes the hassle away from having to look for new tenants and rebuild the relationship. In some cases, however, some action must be taken regardless of the fact the tenant stays the same. For letting agents who manage the property for a landlord, the end-date on a tenancy deposit certificate can simply be amended. In order to update the parties, it’s best practise to re-serve any documentation. While this is desirable and recommended, it is not a requirement of the Deregulation Act 2015. It does, though, ensure a paper trail is available for both parties which could become useful should a dispute arise at the end of the tenancy. If there are any changes to the tenancy such as a change of tenant within the tenant group, a change of landlord, change of property address (i.e. the landlord has another property for the tenants to move in to), or a change from one tenancy deposit scheme to another, then there is a requirement to update and re-serve the Prescribed Information and scheme leaflet. For landlords using our TDS Insured scheme, which is a pay-as-you-protect service where they enter into a new fixed term agreement, even with all the other terms being the same, then the first registration can be ended and the tenancy deposit re-registered and paid for via the landlord’s account for the new term. Once emails of confirmation have been received, the Prescribed Information and scheme leaflet can be sent and served as required for the new registration. If the tenancy ‘rolls over’ into a periodic agreement without any material chnages, then the tenancy deposit is still registered for protection. Although it can be difficult to get your head around, our expert customer service teams can offer help and advice. If you are still unsure about whether or not you need to re-protect a deposit, legal advice should be sought.